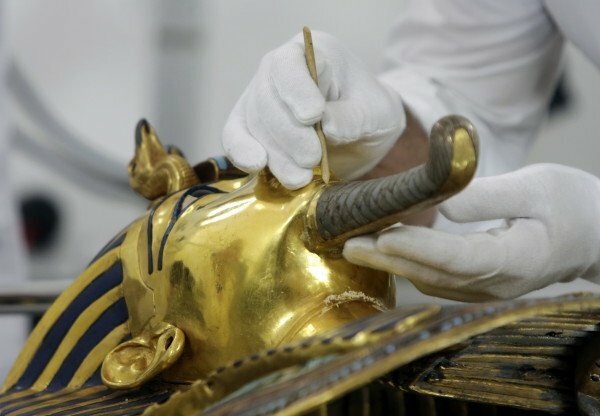 Eight employees at the Egyptian Museum face trial over the botched reattachment of the beard on the burial mask of Tutankhamun, Egyptian media say. Tutankhamun’s mask – a 3,000-year-old artifact – is one of Cairo’s biggest tourist attractions. According to prosecutors, workers then “recklessly” tried to cover up the mistake, using large amounts of inappropriate glue in an effort to fix it. In October 2015, a team of conservators led by German experts began work to remove the damage and reattach the beard professionally. Following successful restoration, Tutankhamun’s mask was put back on public display in December 2015.